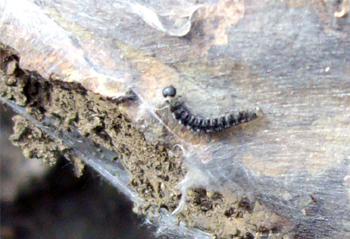 Yponomenta gigas caterpillars and web. I’d never heard of caterpillars that make cobwebs before, but these do. Like many others caterpilars in the family of ermine moths, they form communal webs. I suppose it discourages birds from sticking their beaks in. My book on Canarian insects doesn’t mention them at all, but then they aren’t easy to find unless you know where to look. They live on the Canarian Willow, Salix canariensis which only grows in the Canary Islands and Madeira in places with plenty of water. But there are lots of them in the Caldera de Taburiente, near the campsite at the Playa de Taburiente.